Gemstones have fascinated mankind since the times of the caveman and they captivate us still. Whether you enjoy collecting gemstones for your mineral collection, or use them for healing, for spiritual reasons or for divination, they are always fascinating. Superstition, myth and romance have been attached to crystals since ancient times. Persian mythology claimed the world stood on a giant sapphire whose reflection turned the sky blue. It was thought you blind snakes with emeralds. Amethyst was thought to protect from drunkenness. Basically, they are a solid material in which atoms are arranged in regular patterns. This applies to the salt crystals in your kitchen as much as to the diamond in a ring. You might think that glass is a crystal, but it isn't. There is no crystalline structure because it is cooled too quickly. The actual word crystal comes from the Ancient Greek word krystallos which means icy cold. The Ancient Greeks believed that clear quartz was ice that had frozen so hard it would never melt. What makes one crystal differ from another? It all comes down to its internal atomic structure. Take the graphite in a pencil and a diamond. They are both formed of carbon but they differ in their internal structure, In graphite, the atoms are linked in layers, which are only weakly bonded so it is a very soft material. In diamond, each atom is bonded to four others in a particular rigid compact structure. This makes it the hardest known substance. Diamond has undergone intense extremes of heat and pressure to be formed in this way. Some crystals can look identical to the naked eye, such as citrine and yellow topaz. You need to judge a stone by its colour, its cleavage, its hardness and its specific gravity. Most people are familiar with the scale of hardness with talc the lowest at 1 and diamond the hardest at 10. You can grow synthetic crystals from seed and are actually flawless. It takes several months to grow a beautiful emerald, but under the microscope its structure is not the same as a naturally occcurring emerald. the quartz used in watches and electronics is synthetic quartz. You may bnot realise that all naturally occurring gems have flaws whether they are microscopic inclusions of another material or clearly visible like the rutile found in rutilated quartz. Quartz is a very commonly occurring gem. The best giant crystals are found in Brazil. From coarse sand to the finest amethysts there are many forms of quartz. Colourless rock crystal is the purest. Chalcedonies and jaspers are a form of fine-grained quartz. Iron, for example, gives the colour to amethyst and citrine. Citrine is actually amethyst which has been subjected to extreme temperatures, either naturally or in a laboratory. Smokey quartz is thought to have been exposed to radiation. Scotland is a well-known source of almost black smokey quartz, called morion, and extremely dark citrine called cairngorm. Chalcedonies are carnelian (cornelian), chrysoprase (marketed as Australian Jade) and agate. Rubies are true red corundum. Blue ones are sapphires, other colours are called sapphires as well. Sapphire is next to diamond in hardness. You may not realise that you have sapphires lying around the house if you have any of the old-fashioned emery boards. Emery is impure corundum. Beryl is known as aquamarine and emerald. But one is considerably more valuable than the other! Pure beryl is actually colourless. Emerald has been prized for millennia. Cleopatra was known to have several lucrative emerald mines. Opals are known as unlucky stones but in Roman times they were seen as symbols of power. The Aztecs mined Fire Opal. During the 14th century in Venice, people noticed that opals became more brilliant when wearers caught the Plague and dulled when a person died. This helped reinforce the belief that opal was unlucky. Organic gems include jet, amber, coral and pearl. Jet is formed from ancient wood and amber is formed from the sap. Jet was hugely popular in Victorian times as mourning jewellery, but it is no longer as valued. Minerals can even be found in the form of crystals although they are not common. Silver used to be more valuable than gold in medieval times, and even today gold is not the most valuable metal in jewellery — it is platinum. In alchemy, platinum was believed to be a mixture of gold and silver. The laying on of crystals is an ancient art. It is thought that as light reflects off crystals and stones, the electro-magnetic field of the body, the aura, absorbs the energy. Silicon is an excellent transmitter of vibrations and energy, which is why it is used in the electronics industry and in science. Quartz is made of silicon, and a major component of the human body is also silicon, so it is thought one can tranfer electro-magnetic energy to the other. Using crystals is thought to dissolve stress, remove blockages, support new intentions and bring harmony. They can neutralise negative energies, draw energy away from an over-stimulated area, or re-energise a depleted one. Modern conventional medicine has rubies in its surgical lasers, used for example in the treatment of gallstones. Silicon chips are a vital component of pacemakers and other life-saving equipment. Science has shown that if a crystal is placed in an energy field, it collects that energy and contains it. It might change or transmute the energy in the process. Some crystals, such as quartz, amplify energy. The crystal then radiates energy out again. For example, if an acupuncture needle is coated in quartz, its effect is enhanced by 10% to 12%. The exceptions are black crystals, which absorb energy, but do not release it. This makes them extremely useful as protection against unpleasant or hostile vibrations. Crystals are also used to clear the atmosphere in a room. You can place a crystal ball or a large crystal druze in a room to help balance the "feel" of a room. So how do you know which crystal is for you? You'll find that one particular crystal grabs your attention. It may not be the biggest, the most beautiful or the most expensive, but it is the one you immediately want to hold in your hand. The one that feels instinctively right. Since crystals absorb and emit energy, they should be cleansed when you first get them to rid them of any negative energies they may have absorbed from being handled before. You can easily cleanse your crystal by immersing it in salt water, then rinse in fresh water and allow to dry naturally. Alternatively, you could simply hold it under running water then let it dry in the sun. Delicate crystals that cannot be left in water, can sit on rock salt crystals for a few hours. You could also let the stone sit on a quartz cluster if you have a cluster large enough. If you decide to wear or carry a crystal for a specific purpose you need to cleanse it regularly and program it. In other words, it's as simple as holding the crystal in your hands and calmly stating in your mind what yiou want the stone to do. 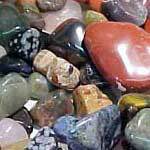 Whether you place your belief in the stone itself or in your own subconscious capabilities, the process does work and can be quite effective. Many crystals have been used for healing since ancient times. Thousands of years ago, Galen recommended using hematite for headaches and the Chinese have always used iron pyrite to stimulate healing with broken bones. The Egyptians left instructions on a powder that was used on wounds made of ground malachite and chrysoprase. In fact, science has shown that this is an effective antibacterial that can kill staphylococcal infections. Modern day crystal healers would recommend rose quartz or garnet for ailmetns involving the ehart. For the liver, you'd be looking at using aquamarine, bloodstone or carnelian. The gall bladder is associated with carnelaian, citrine and tiger's eye. The female reproductive system is associated with moonstone, chrysoprase, and unakite. Amethyst or hematite is recommended for a tension headache and lapis lazuli for migraine. Gems have also been used since ancient times in elixirs. The gem is placed in water and left in the sun. Afterwards, the water is drunk or bathed in. Since wine was often substituted for water, or brandy added as a preservative, this was a very popular remedy. You need to know what you are doing, however, because some stones like unpolished malachite are poisonous used in this way. Crystals are also used to treat and heal emotional imbalances and help with mental attitudes. For example, amber neutralises negative states of mind and balances the underlying disequilibrium. Jet fights mood swings and deep depression. Guilt is treated by rose quartz, the "stone of love" — it helps you forgive others and forgive yourself, allowing love to flow freely again. Aquamarine has long been associated with removing blocks to communication and the recently discovered stone sugilite helps with dyslexic problems. Colour is just as important as type of stone. BLACK or BROWN stones are often used to shield and disburse negative energies. Examples are smokey quartz, jet, obsidian, black tourmaline (schorl), onyx and black sapphire. YELLOW stones are often associated with abundance. Stones such as citrine, topaz, tiger's eye and yellow sapphire, which in India is the stone of Ganesh, the elephant god of prosperity. Stones that enhance creativity are often GREEN such as malachite, chrysoprase, green tourmaline and amazonite. Love is, of course, PINK, and the stones for love are rose quartz and rhodonite. But angel hair quartz (rutilated quartz) is also known as a stone that brings love into your life. Stones that help with your powers fo intuition include PURPLE, BLUE and WHITE stones. Purple stones include amethyst, charoite, fluorite and purple sapphire. Blue stones include lapis lazuli, sodalite, sapphire and blue agate. White stones include selenite, moonstone and apophyllite. RED is the colour of assertiveness and vitality. Garnet, ruby, jasper and carnelian are good examples of red gemstones. CLEAR crystals bring clarity and focus. Examples are diamond, quartz and agate. Sometimes you can find two stones in one. Ametrine is a beautiful natural example of amethyst that has been partially turned into citrine. If you hold the purple stone up to the light, you can see the yellow glow of citrine deep inside. Tourmalinated quartz has slivers of tourmaline inside the clear quartz.